The Mandalay Resort contains the main hotel in the main tower, as well as two additional options. The all-suite THEhotel and the Four Seasons Hotel offer more exclusive, ultra-luxurious options. You might be right in the middle of the desert, but 2700 tons of real sand, a 1.6 million gallon wave pool and around 100 rentable cabanas, villas, bungalows and day beds make this a real Caribbean seaside experience. 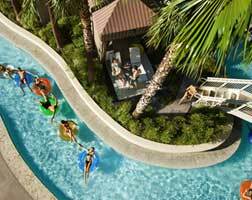 Kids will love riding down the Lazy River, riding the waves and exploring the acres of fun. Overlooking the beach is the Beachside Casino, three floors of glass-fronted air-conditioned gaming and luxury living. On the third level, the Moorea Beach Club awaits, a truly adult ‘European’ style bathing and relaxation area with all kinds of options for socialising and entertaining, some with all the privacy you need. For something truly wild, head for the giant Shark Reef Aquarium with 2000 exotic inhabitants like giant rays, piranhas, and even rare golden crocodiles. Divers can swim with sharks in the Shipwreck Exhibit for the ultimate thrill. Eating and drinking is truly out-of-the-ordinary with nearly thirty different options, from quick 24/7 snacks to some of the most respected celebrity chefs in America. Japanese to Russian, Mexican to Italian, big buffets to fine dining, steak to seafood, it’s a menu that’ll be impossible to exhaust. Work off the calories or enjoy the very height of pampering at the Mandalay’s gyms and spa. The SpaMandalay has everything a body could need and the fitness centre will put you through your paces. The Cardio Centre is free for guests and has all the equipment you’ll need for getting active, in a great scenic spot down by the beach. There is another gym option in the Bathhouse at THEHotel. As one of the big five convention centres in the US, business is big here. From a giant 30,000 down to an intimate 30, this is a professional meeting centre par excellence, with service and facilities to match. Take a Media or Hospitality Suite in the hotel for another unique client entertainment, launch or meeting option. Social get-togethers like weddings are made extra special with ten very special locations, low-key to lavish, but always memorable. Even on the beach! Accommodation in the 3,300 rooms stretches from casual elegance for two, right up to enormous suites with 180 degree views of the glittering lights of Las Vegas. All have the contemporary style and luxury fittings of a great hotel. Shops are on hand for a variety of things, from high fashion to designer tattoos, gifts to beauty products. Golfers will enjoy courses that are close by and are full of challenge and character. Expert concierge services will take care of booking your round of golf, restaurant table, beach cabana, spa, show, tour or the myriad other things that make Vegas great.